I have been following Mree's blog for years. She has the best shopping finds and posts about her life in Boston and travels around the world (she just got back from London!). I asked Mree to share her perfect nautical outfit today and I am loving what she came up with! Hi Everyone!! I'm Mree from Twin Living Blog. When Kate asked me to do a guest post, I was beyond excited!! Not only do I love her blog but she is totally one of my blog inspirations. She finds the BEST nautical theme items. We both share a love of all things nautical. I decided to create an outfit based on my favorite nautical item, Anchors. 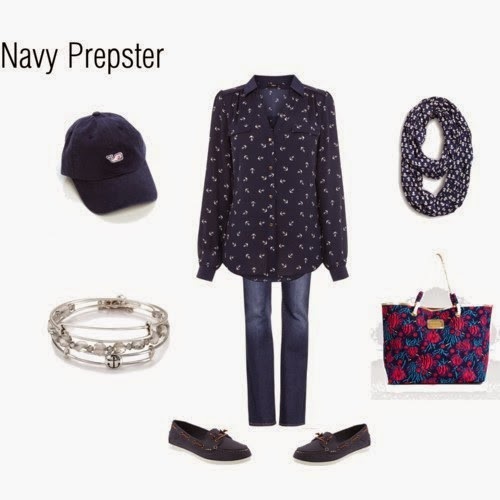 My outfit is both preppy and nautical, two themes that I like to where together. While it may seem a bit over the top, I feel like it all works well together. Can you tell that I'm from New England?? Ha! Of course, I always try to add a pop of color to my outfit which is usually pink. I love the color pink!! How great is that Lily Pulitzer tote bag? So cute!! The rope handles make it the perfect summer tote. I'm all about the summer tote!! What's your favorite nautical theme item?? Kate, thank you so much for having me. It's been a pleasure. Hope you are having a fab vacation!! Thanks for reading, please stop by blog to say hello. I love meeting new blogging friends. Thanks Kate!! Hope you are having a wonderful vacation!! !